When children and presents go missing, it's up to Barney to venture out through five stages and find them with only love and hugs as his weapons. Sadly, Barney cannot be killed (such a hypocrite!) and instead teaches the player about dangerous situations when they are encountered. Barney uses Lecture... it's Super Effective! 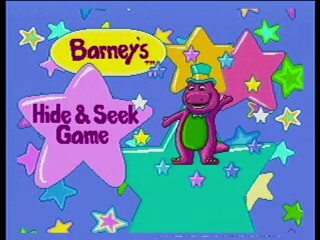 Barney's Hide and Seek Game is a Sega Genesis exclusive that was originally a speedrun over 5 minutes until Zastbat discovered that the levels wrap if you hold left. For all but the third level, holding left is faster than holding right.